The product is not available to either (i) current Cardmembers of any Hyatt Credit Card, or (ii) previous Cardmembers of any Hyatt Credit Card who received a new Cardmember bonus within the last 24 months. Already have a World of Hyatt Card? 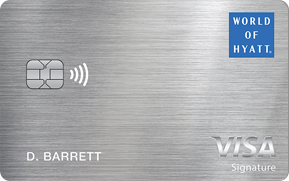 For fast, easy and secure checkout simply tap to pay where you see the Contactless symbol. For more information, please see www.chase.com/contactless. The product is not available to either (i) current Cardmembers of any Hyatt Credit Card, or (ii) previous Cardmembers of any Hyatt Credit Card who received a new Cardmember bonus within the last 24 months. You will qualify for 25,000 Bonus Points if you make $3,000 in Purchases within 3 months of account opening. You will qualify for 25,000 Bonus Points if you make a total of $6,000 in Purchases within 6 months of account opening (for a possible total of 50,000 Bonus Points). After qualifying, please allow 6 to 8 weeks for Bonus Points to post to your World of Hyatt account. ("Purchases" do not include balance transfers, cash advances, travelers checks, foreign currency, money orders, wire transfers or similar cash-like transactions, lottery tickets, casino gaming chips, race track wagers or similar betting transactions, any checks that access your account, interest, unauthorized or fraudulent charges, and fees of any kind, including an annual fee, if applicable.) To be eligible for this bonus offer, your card account must be open and not in default at the time of fulfillment. Chase is not responsible for offer fulfillment. If your card account is not open for at least 3 months, Hyatt and Chase reserve the right to deduct the Bonus Points from your World of Hyatt account. All World of Hyatt terms and conditions apply and are available at worldofhyatt.com/terms. Rewards Program Agreement: For more information about the World of Hyatt® Credit Card rewards program, view the latest Rewards Program Agreement. We will mail your Rewards Program Agreement once your account is established. If you become a Chase Online customer, your Rewards Program Agreement will also be available after logging in to chase.com. How you can earn Bonus Points: You'll earn World of Hyatt Bonus Points when you, or an authorized user, use a World of Hyatt® Credit Card to make purchases of products and services, minus returns or refunds. Buying products and services with your card, in most cases, will count as a purchase; however, the following types of transactions won't count as a purchase and won't earn World of Hyatt Bonus Points: balance transfers, cash advances and other cash-like transactions, lottery tickets, casino gaming chips, race track wagers or similar betting transactions, any checks that access your account, interest, unauthorized or fraudulent charges, and fees of any kind, including an annual fee, if applicable. 4 Bonus Points: You'll earn 4 World of Hyatt Bonus Points for each $1 USD spent on purchases made at Hyatt hotels and resorts (including at participating restaurants and participating locations that are owned, managed, franchised or licensed by Hyatt Corporation or its subsidiaries or affiliates). 2 Bonus Points: You'll earn 2 World of Hyatt Bonus Points for each $1 USD spent on purchases made in any of the following rewards categories: restaurants (excluding dining purchases that qualify for 4 Bonus Points as described above); airline tickets when purchased directly with the airline; local transit/commuting; fitness club and gym memberships. 1 Bonus Point: You'll earn 1 World of Hyatt Bonus Point for each $1 spent on all other purchases. Information about earning/transferring Bonus Points to Hyatt: You must be a World of Hyatt member to receive and use Bonus Points, Free Night Awards, or other World of Hyatt Program benefits. If you are currently a World of Hyatt member, Bonus Points you earn through your World of Hyatt® Credit Card will be deposited into your World of Hyatt Program account as described below. If you are not already a World of Hyatt member, Chase will provide your information to Hyatt upon approval of your World of Hyatt® Credit Card application and Hyatt will enroll you in the World of Hyatt Program account. World of Hyatt Bonus Points earned through the World of Hyatt® Credit Card can only be transferred to the primary card member's World of Hyatt Program account. World of Hyatt Bonus Points earned during a billing cycle will be automatically transferred to Hyatt after the end of each billing cycle and will be placed in the member's World of Hyatt Program account, at which point they will be available to be used. How you could lose Bonus Points that have not yet transferred to Hyatt: You'll immediately lose all World of Hyatt Bonus Points that haven't been transferred to your World of Hyatt Program account if your card account status changes, or your card account is closed for program misuse, fraudulent activities, failure to pay, bankruptcy, or other reasons described in the terms of the Rewards Program Agreement. Points expiration: The Bonus Points transferred to your World of Hyatt Program account won't expire as long as your card account is open. If your card account is closed, you will lose any unredeemed points (including Bonus Points) in your World of Hyatt Program account if you fail to have qualifying activity in the World of Hyatt Program at least once every 24 months. Please see the World of Hyatt Program Terms and Conditions at worldofhyatt.com/terms for details on how to keep your account active. Also, if your World of Hyatt Program account is terminated, any unredeemed points in your World of Hyatt Program account will be lost. Rewards Categories: Merchants who accept Visa/MasterCard credit cards are assigned a merchant code, which is determined by the merchant or its processor in accordance with Visa/MasterCard procedures based on the kinds of products and services they primarily sell. We group similar merchant codes into categories for purposes of making rewards offers to you. Please note: We make every effort to include all relevant merchant codes in our rewards categories. However, even though a merchant or some of the items that it sells may appear to fit within a rewards category, the merchant may not have a merchant code in that category. When this occurs, purchases with that merchant won't qualify for rewards offers on purchases in that category. Purchases submitted by you, an authorized user, or the merchant through third party payment accounts, mobile or wireless card readers, online or mobile digital wallets, or similar technology will not qualify in a rewards category if the technology is not set up to process the purchase in that rewards category. For more information about Chase rewards categories, see www.Chase.com/RewardsCategoryFAQs. All World of Hyatt Program Terms and Conditions apply and are available at worldofhyatt.com/terms. For details on redeeming World of Hyatt points, please visit worldofhyatt.com and see the World of Hyatt terms and conditions, available at worldofhyatt.com/terms. To qualify for this Free Night Award, you must be the primary cardmember and your card account must be open and not in default at the time the award is issued. Please allow up to 10 weeks after your cardmember anniversary each year for your Free Night Award to be issued to you. ("Anniversary" is the date that is twelve months after your account open date, and the same date each twelve months thereafter.) This Free Night Award is good for one (1) night in any available standard room within 12 months from issuance at any Hyatt hotel or resorts designated as Category 1 through 4 under the World of Hyatt program. Not valid at properties in any other category or at Miraval, Hyatt Zilara or Hyatt Ziva resorts or Oasis homes. To find Category 1 through 4 hotels or resorts, visit worldofhyatt.com. An authorized user will not receive this Free Night Award. Hyatt reserves the right to reclassify any hotel or resort at any time for any reason in its sole discretion (provided that reclassification of a hotel or resort will not affect a previously booked award reservation). This Free Night Award must be redeemed for a reservation with a checkout date before the expiration date of the award. This Free Night Award cannot be redeemed for packages. This Free Night Award may be applied only to the guest room and does not apply toward food, beverage, incidental expenses, service charges, or hotel specific charges. Reservations for Free Night Award redemption are subject to availability and must be made in advance by visiting the My Awards page within your account at worldofhyatt.com, or by calling 888.75.HYATT or your nearest Hyatt Global Contact Center. Chase is not responsible for offer fulfillment. Except as otherwise expressly set forth here, redemption of this Free Night Award is subject to all terms applicable to Free Night Awards as set forth in the World of Hyatt terms and conditions, available at worldofhyatt.com/terms. If you, as the primary cardmember, spend at least $15,000 in purchases during an Anniversary Year, you will receive a Free Night Award good for one (1) night in any available standard room at any Hyatt hotel or resorts designated as Category 1 through 4 under the World of Hyatt program. This Free Night Award may be earned once each Anniversary Year regardless of the amount of purchases in such year. ("Anniversary Year" means the year beginning with your account open date through the first statement date after your account open date anniversary, and the 12 monthly billing cycles after that each year.) Purchases are when you, or an authorized user, use a card to make purchases of products and services, minus returns or refunds. Buying products and services with your card, in most cases, will count as a purchase; however, the following types of transactions won't count: balance transfers, cash advances, travelers checks, foreign currency, money orders, wire transfers or similar cash-like transactions, lottery tickets, casino gaming chips, race track wagers or similar betting transactions, any checks that access your account, interest, unauthorized or fraudulent charges, and fees of any kind, including an annual fee, if applicable. This Free Night Award is good for one (1) night in any available standard room within 12 months of issuance at any Hyatt hotel or resort designated as Category 1 through 4 under the World of Hyatt program. After qualifying, please allow 2 to 3 weeks for the Free Night Award to be issued to your World of Hyatt account at worldofhyatt.com. Not valid at properties in any other category or at Miraval, Hyatt Zilara or Hyatt Ziva resorts or Oasis homes. To find Category 1 through 4 hotels or resorts, visit worldofhyatt.com. An authorized user will not receive this Free Night Award. Hyatt reserves the right to reclassify any hotel or resort at any time for any reason in its sole discretion (provided that reclassification of a hotel or resort will not affect a previously booked award reservation). This Free Night Award must be redeemed for a reservation with a checkout date before the expiration date of the award. This Free Night Award cannot be redeemed for packages. This Free Night Award is valid only for the guest room and may not be applied toward food, beverage, incidental expenses, service charges, or hotel specific charges. Reservations for this Free Night Award redemption are subject to availability and must be made in advance by visiting the My Awards page within your account at worldofhyatt.com, or by calling 888.75.HYATT or your nearest Hyatt Global Contact Center. Except as otherwise expressly set forth here, redemption of a Free Night Award is subject to all terms as set forth in the World of Hyatt terms and conditions, available at worldofhyatt.com/terms. Chase is not responsible for offer fulfillment or the provision of or failure to provide the stated benefits and services. The primary cardmember will receive Discoverist status in the World of Hyatt program as long as their World of Hyatt Credit Card is open and not in default and the cardmember complies with the World of Hyatt terms and conditions (available at worldofhyatt.com/terms). An authorized user will not receive Discoverist status or associated benefits in the World of Hyatt program as a result of his or her designation as an additional authorized user of the World of Hyatt Credit Card (provided that (s)he may independently enroll in and earn Discoverist status in the World of Hyatt program as otherwise set forth in the World of Hyatt program terms and conditions). You, as the primary cardmember, will receive 5 World of Hyatt Tier-Qualifying Night credits in your World of Hyatt account within 8 weeks of your World of Hyatt Credit Card account open date. Every calendar year you will receive 5 Tier-Qualifying Night credits within 8 weeks of January 1. To qualify for the 5 World of Hyatt Tier-Qualifying Night credits each January, your World of Hyatt Credit Card account must be open and not in default and you must be a member in good standing with the World of Hyatt program. World of Hyatt Tier-Qualifying Night credits are valid from the date of issuance through December 31st of the same calendar year. An authorized user will not receive the 5 World of Hyatt Tier-Qualifying Night Credits. World of Hyatt Tier-Qualifying Night credits will apply to achieving World of Hyatt status and milestone benefits applicable to Tier-Qualifying Night requirements (as outlined in the program terms). The 5 Tier-Qualifying Nights earned are not Free Night Awards. Chase is not responsible for offer fulfillment or the provision of or failure to provide the stated benefits and services. You, as the primary cardmember, will earn 2 World of Hyatt Tier-Qualifying Night credits for every $5,000 in Purchases. Purchases are when you, or an authorized user, use a card to make purchases of products and services, minus returns or refunds. Buying products and services with your card, in most cases, will count as a purchase; however, the following types of transactions won't count: balance transfers, cash advances, travelers checks, foreign currency, money orders, wire transfers or similar cash-like transactions, lottery tickets, casino gaming chips, race track wagers or similar betting transactions, any checks that access your account, interest, unauthorized or fraudulent charges, and fees of any kind, including an annual fee, if applicable. Chase and Hyatt have the right to determine which purchases qualify for this offer. Chase and Hyatt reserve the right to change or end this offer at any time. There is no limit to the number of World of Hyatt Tier-Qualifying Night credits that you can earn. An authorized user will not receive World of Hyatt Tier-Qualifying Night Credits. World of Hyatt Tier-Qualifying Night credits are valid from the date of issuance through December 31st of the same calendar year. World of Hyatt Tier-Qualifying Night credits will apply to achieving World of Hyatt status and milestone benefits applicable to Tier-Qualifying Night requirements (as outlined in the program terms). Please allow up to 8 weeks from the last day of the calendar month when you qualify, for World of Hyatt Tier-Qualifying Night credits to be added to your World of Hyatt account. To qualify for the World of Hyatt Tier-Qualifying Night credits, your account must be open and not in default at the time of processing and fulfillment. Chase is not responsible for offer fulfillment or the provision of or failure to provide the stated benefits and services. Receipt and use of any World of Hyatt® program points, awards or benefits require membership in the World of Hyatt program. All World of Hyatt points earned through use of the World of Hyatt Credit Card are "Bonus Points" as defined in the World of Hyatt terms and conditions. Bonus Points may be redeemed for awards in the World of Hyatt program, but are not counted for the purposes of calculating a member's progress towards elite status in the World of Hyatt program. All participation in the World of Hyatt program, including accrual and redemption of Bonus Points, Free Night Awards, Tier Qualifying Night Credits and receipt of membership benefits, is subject to the terms and conditions of the World of Hyatt program. Visit worldofhyatt.com/terms for complete terms and conditions of the World of Hyatt program. Terms and conditions of the World of Hyatt program may be modified and offers, services, and benefits may be added or deleted at any time as described in the World of Hyatt program terms and conditions. Individuals whose request for a credit card is not approved will not be enrolled in the World of Hyatt program through this offer, although existing World of Hyatt memberships will not be affected. Additional authorized users will not be enrolled in the World of Hyatt program as a result of this offer. World of Hyatt Bonus Points awarded through the use of the authorized user's card will only be credited to the primary cardmember's World of Hyatt account. Authorized users will not be eligible for elite status in the World of Hyatt program, or associated benefits, based on their use of the primary cardmember's World of Hyatt Credit Card. The trademarks Hyatt®, Hyatt Hotels & Resorts®, World of Hyatt®, Park Hyatt®, Miraval®, Grand Hyatt®, Hyatt Regency®, Andaz®, Hyatt Centric®, The Unbound Collection by Hyatt™, Hyatt Place®, Hyatt House®, Hyatt Zilara™, Hyatt Ziva™, Hyatt Residence Club®, and related marks are trademarks of Hyatt Corporation or its affiliates. Accounts subject to credit approval. Restrictions and limitations apply. Credit Cards are issued by Chase Bank USA, N.A. Offer subject to change.